Google Nexus 7: With a powerful beast of quadcore, Tegra 3 processor this packs a punch. 1GB RAM doesn't hurt either. Amazon Kindle Fire HD (7-inch): Under the hood you'll find a OMAP 4470 dualcore chip and a SGX544 graphics engine which Amazon claims runs faster and better than the Tegra 3. Kobo Arc: The Kobo matches the 1GB RAM and although it doesn't have quite as much power it has a 1.5 GHz duel-core processor for stamina. Kobo Arc: There's WiFi and Micro USB support while Wi-Fi Direct means you send multimedia to a TV. You well however need an adaptor for that. 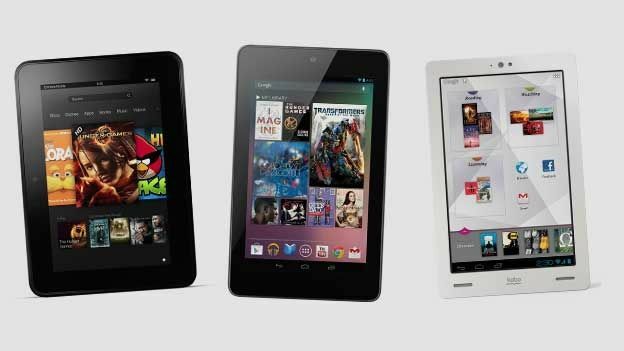 Which 7-inch Android tablet are you impressed by the most? Let us know your thoughts in the comments section below.